On June 2, 2010, community and floral leader Lucille Belen, AAF, passed away at age 97. 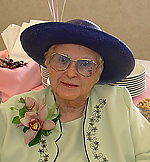 Belen was inducted into the Michigan Floral Foundation’s Hall of Fame on April 29, 2010, for a lifetime of floral achievements. In 1936, Belen began working in the shop her parent’s founded, Belen’s Flowers in Lansing, MI. While working in the shop, Belen took courses at a floral school. In 1950 she founded the Belen School of Floral Design in Lansing, offering a one-week course held annually that became known nationwide. The state of Michigan approved and accredited the school and official certificates were given to students upon completion of the course. The school ran successfully for 40 years. In addition to the Michigan Floral Foundation’s Hall of Fame, the Michigan Floral Association also honored Lucille in 1973 with Retailer of the Year; in 1994 with the Lifetime Achievement Award; and in 2005 with the Special Recognition Award. In 1973, she won the Paul Krone Retailers Award. In 1975 the Lansing Regional Chamber of Commerce awarded her for her tireless community service. She has four awards from three Michigan Governors. Belen’s Flowers has received awards from Teleflora and FTD. In 2001, she was inducted into the Michigan Women’s Hall of Fame. She received the Greater Lansing Fine Arts Council Award, where she worked as an advisor, for her campaign to save the trees on the Lansing Capital grounds. She was a strong supporter and donor to fine arts, serving on the board of the Lansing Symphony, and enjoyed frequent trips there and to Lansing’s Boarshead Theater and Michigan State University’s Wharton Center for the Arts in East Lansing. Belen also served on the foundation board at Lansing Community College and the board at Ingham Medical Hospital, and started the Lucille Belen Scholarship for aspiring nurses. During the 20 years she spent as the chairwoman of the health committee on the Ingham Medical Board, she raised money to fund the Ingham Regional Medical Hospital on Greenlawn in Lansing. The Lucille Belen Legacy Society benefits the Hospice House of Mid-Michigan in Lansing. She assisted with zoning for Thomas M. Cooley Law School, and fundraising for construction of the Michigan Historical Society Museum, both in Lansing. She also was instrumental in preventing the Lansing Board of Water and Light from leaving the city. She was a board member of the Capital Area Transportation Authority (CATA). She was a member of the Lansing Zonta Club, the Lansing Women’s Club, the Lansing Women’s Literary Club, the Capital Regional Communications Foundation and the Ingham County Jury Commission.